The heat and humidity have begun to wear on plants as well as humans in my patch of Piedmont. I saw a notice from a local extension agent that dreaded basil mildew disease has been spotted. I think it held off longer than usual — as did most of the fungal diseases — because our June was unusually dry and hot. July has brought heavy, but scattered rains, and lingering humidity and heat. 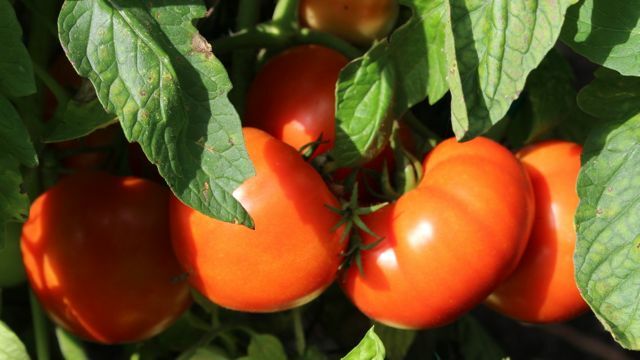 Fungal diseases are certain to soon plague my tomatoes, and perhaps the beans. The vegetables, while still producing well, are looking a bit tired. Many flowers are still blooming well, which the abundant insects are clearly appreciating. The nearly butterfly-free summer continues at my house. 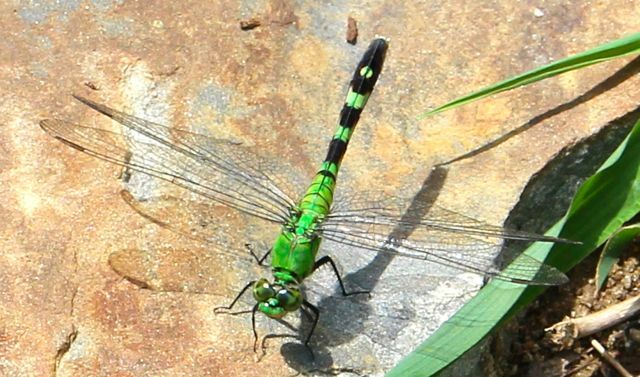 Iridescent members of the dragonfly clan dominate the thick air, causing me to worry about the fate of the few butterflies I am seeing. The rains have finally brought around a few butterflies, I’m happy to say. 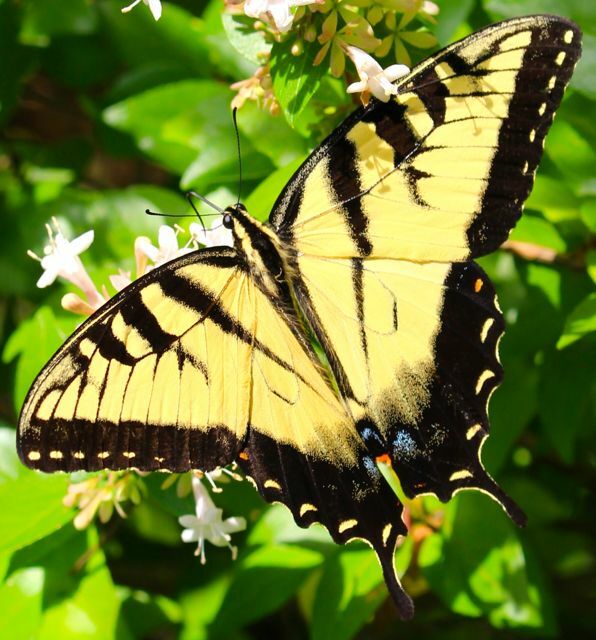 This Eastern Tiger Swallowtail was enjoying the Chinese Abelia flowers that finally opened after we got some rain. 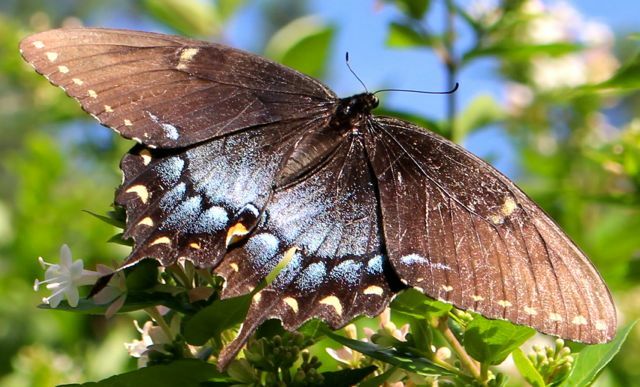 No clouds of Eastern Tiger Swallowtails this year, but a few are passing through from time to time. Pearl Crescents (I think that’s what they are) are easily the most numerous butterflies on my flowers. 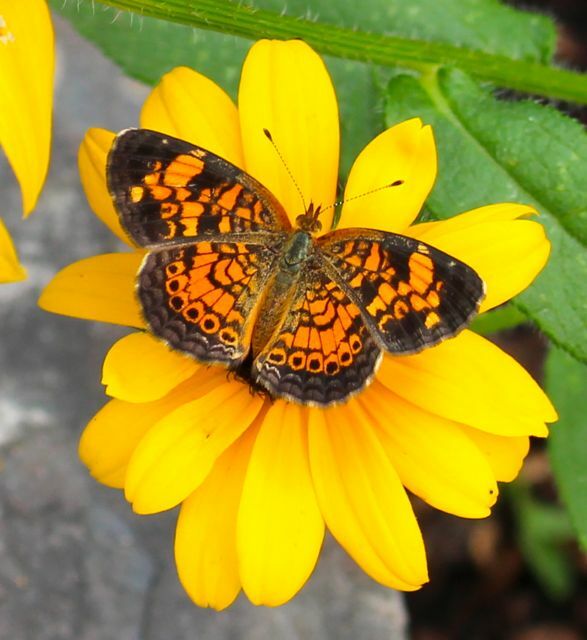 A Pearl Crescent enjoying a Rudbeckia flower. 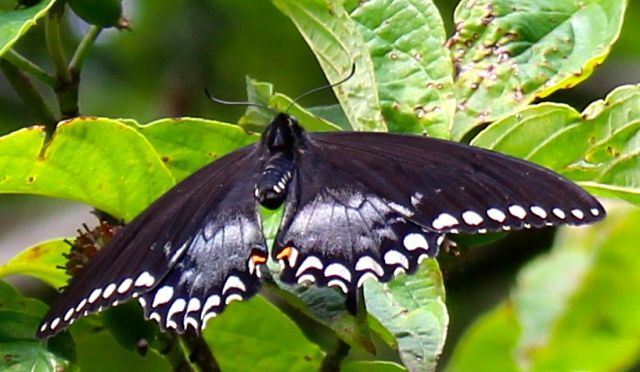 I spotted a couple of dark swallowtails over the last few days. And this one high up on a dogwood yesterday was drying out after a bit of rain from the previous evening. 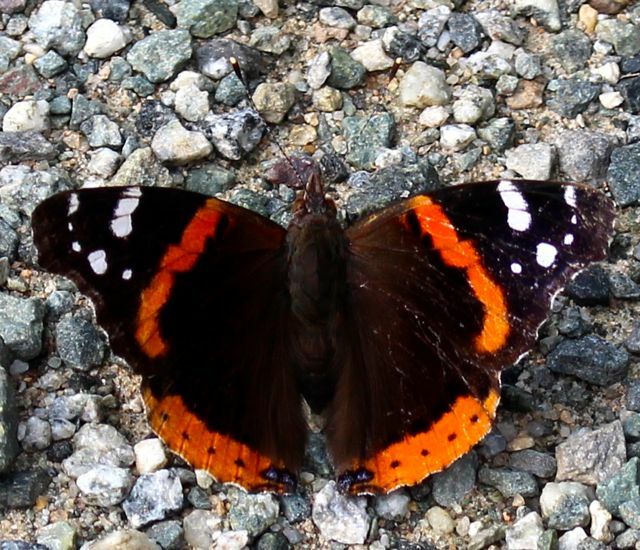 My happiest butterfly moment of the summer so far was this Red Admiral sunning itself on my driveway yesterday. This is the first one of this species I’ve seen all year. 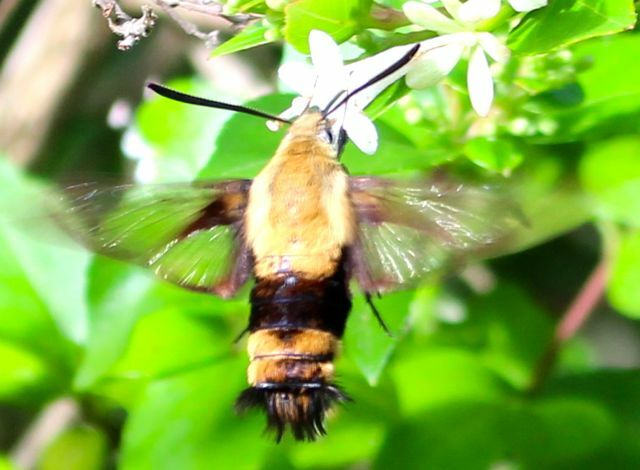 More numerous — by a bit — than the butterflies are the sphinx moths, also called hummingbird moths, because their mostly clear wings vibrate as quickly as those of hummingbirds as they hover beside flowers to drink nectar. As an amateur photographer, I find them very frustrating to capture. But I’ve gotten a few almost decent shots over the last few days, if you’ll indulge me. This is typically how I see them, wings nearly invisible as they hover for a drink. 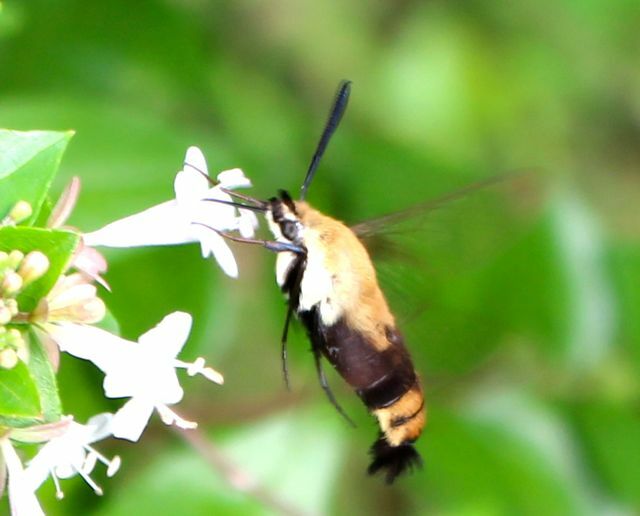 In this hover shot, you can at least see the outline of their wings. 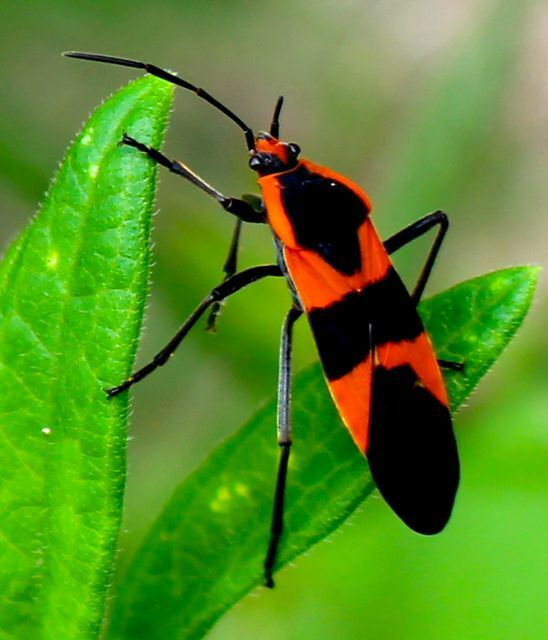 Yesterday, I saw one spread out on a tomato leaf sunning itself in the early dawn light. We had very heavy dew on the ground, and I think it was drying itself. 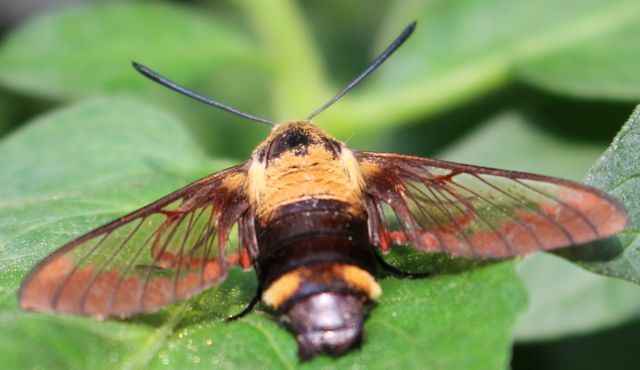 Finally, you can actually see its beautiful wings in this shot. These creatures are so ethereal as they almost perpetually dance among my flowers that I think of them as tiny angels blessing my efforts. I’ll close this photo post with a few flower shots to show you what the insects are enjoying. 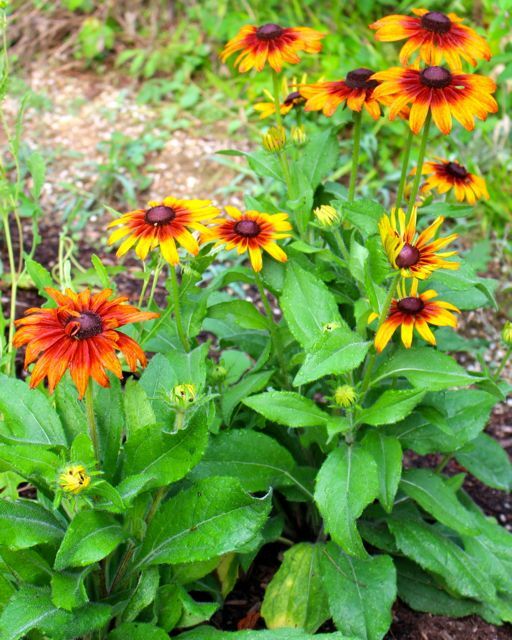 Seed-grown Rudbeckia ‘Cappuccino’ has turned into a stunning plant seemingly oblivious to the heat and humidity. Score! 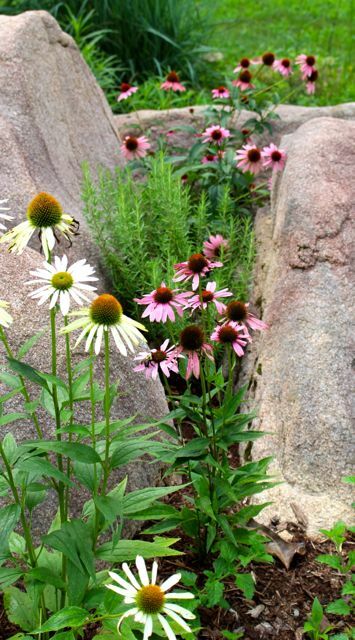 Echinaceas in the boulder garden are covered in pollinators from dawn to dark. That’s a rosemary plant in the middle. It loves the heat from the sun-warmed rocks. 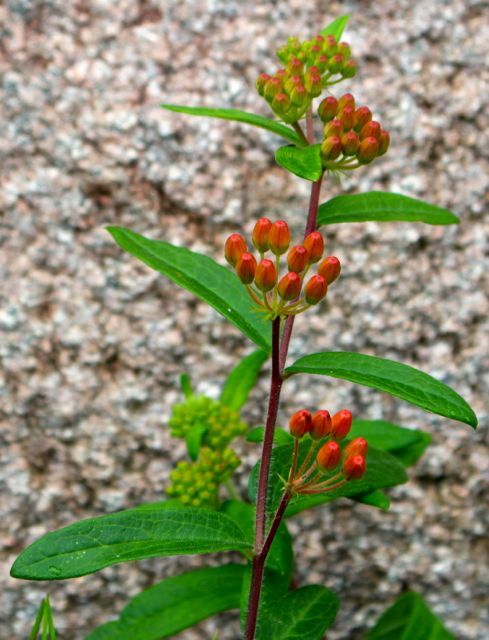 The milkweeds I added to the boulder garden last fall continue to bloom — repeatedly! This butterfly weed (Asclepias tuberosa) is on its second round of bright blossoms. The rain made the weeds explode into productivity, of course. My gardening to-do list grows ever longer, while my enthusiasm for working in the summer weather continues to wane. Still, for fresh-picked blueberries, juicy tomato sandwiches, and a dazzling array of pollinators, I’ll endeavor to keep up as best I can. Amelia tomatoes — so good! Stay cool and hydrated, ya’ll. Fall planting season will be here before we can turn around twice. 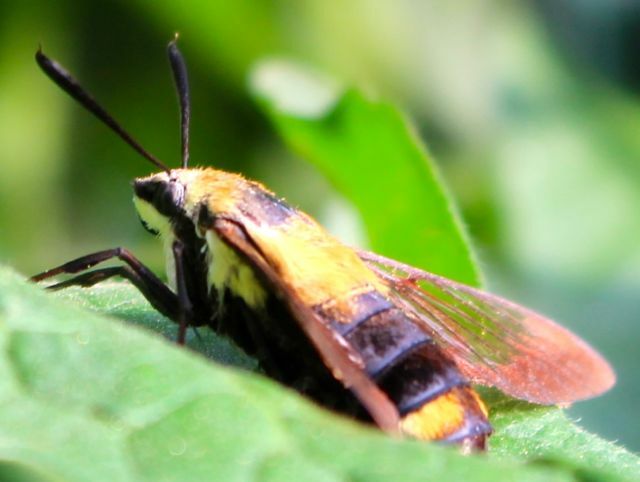 This entry was posted on July 9, 2015, 7:46 am and is filed under Favorite Plants, Native Wildlife, piedmont gardening, Vegetable Gardening. You can follow any responses to this entry through RSS 2.0. You can skip to the end and leave a response. Pinging is currently not allowed. I love this blog post. Thank you! I’m glad you enjoyed it. As always, thanks for stopping by.